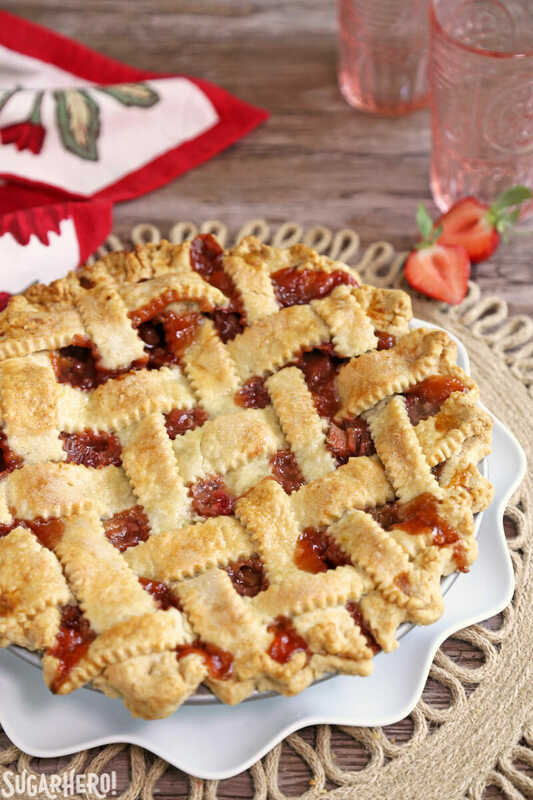 Whenever rhubarb season arrives, I try to make a Strawberry Rhubarb Pie at least once or twice. It’s my husband’s favorite dessert, and he’s been known to request a birthday strawberry rhubarb pie instead of a cake on occasion! He likes them because they’re refreshingly sweet-tart, I like them because they’re simple to throw together and they highlight the best of late-spring produce. 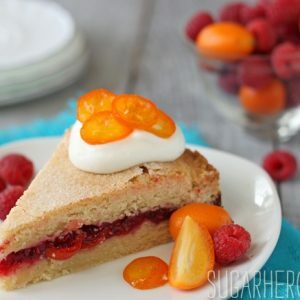 I love fruit pies because they’re so simple–just throw together some freshly-chopped fruit, some sugar, a bit of a thickener (more on this in a bit) and you’re good to go! I usually make my own pie crust, but when I’m short on time, I find that the Trader Joe’s all-butter pie crust is a great substitute. Easy to work with, flaky, and has a nice buttery flavor! Can I Use Frozen Fruit In My Strawberry Rhubarb Pie? Because fresh berries can be expensive, and because rhubarb (and quality strawberries!) are not always in season, it’s tempting to swap in frozen rhubarb and berries–but will the taste and texture of the pie suffer? The good news is, you can definitely make a strawberry rhubarb pie with frozen fruit and rhubarb. In fact, I like to buy a lot of rhubarb when it’s cheapest, slice it into small pieces, and freeze it for later use. (Remember those birthday pies I mentioned? That’s all thanks to frozen rhubarb!) Just arrange the slices in a single layer on baking sheets, then once they’re frozen, place them in freezer bags and you have frozen rhubarb that’s easy to measure and scoop out. Of course, frozen berries can’t quite compete with the beauty of a perfectly ripe summer strawberry. But if frozen is what you have on hand, you can definitely make it work! Just allow the berries and the rhubarb to defrost completely in a strainer, so that the extra moisture from defrosting is removed, then proceed with the recipe as normal. You’ll be pleasantly surprised at how well frozen produce can work in this pie! 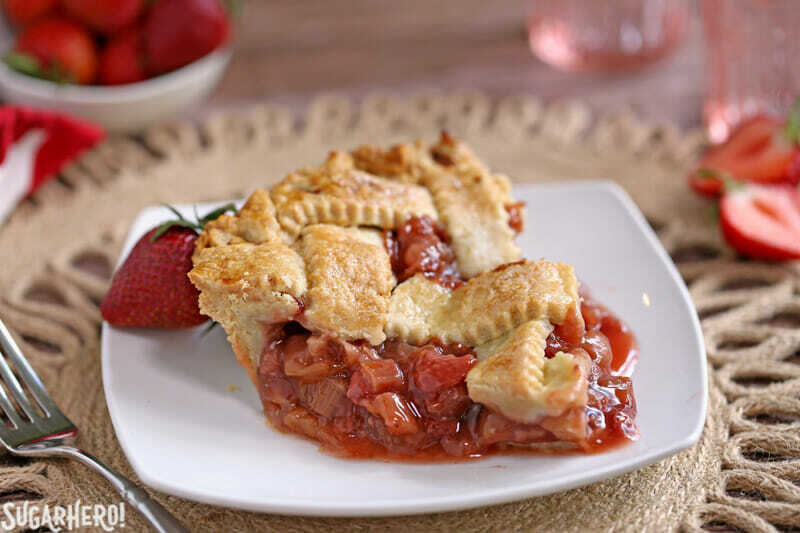 How Do I Thicken My Strawberry Rhubarb Pie? The question of how to thicken fruit pies is hotly debated. Some people swear by tapioca pearls, others are loyal to corn starch or flour. If you scan the recipe down below, you’ll see that I use a different ingredient, one you might not be familiar with: Ultra Gel. This is a starch-based thickener that’s great for pie fillings, gravy, quick jams…really, any food that you need to thicken quickly! I like Ultra Gel because it doesn’t require heat to set, it gels the filling without making it too thick or gloopy, and it doesn’t leave a starchy taste like corn starch or flour sometimes can. There are also other products (like ClearJel) that behave similarly, but do require heat. It’s been my choice for fruit pies ever since I discovered it a few years ago, and I’m never disappointed when I use it. I can often find Ultra Gel in my local grocery store in the canning section, but I know that it’s not available to everyone. If you don’t want to order it online, you can easily substitute corn starch instead–just follow the Note at the bottom of the recipe. 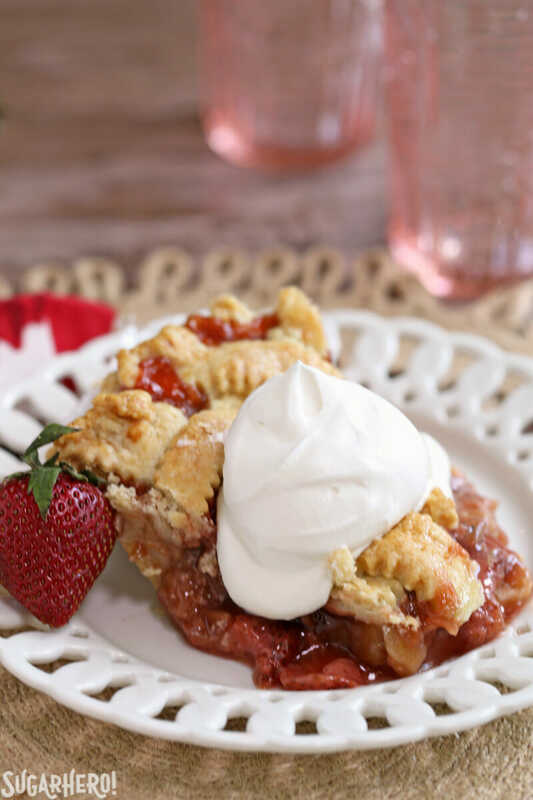 I hope you’ll give this Strawberry Rhubarb Pie a try! It’s the perfect blend of sweet and tart, with a bold rhubarb and berry flavor just tempered by the brown and white sugars. The filling is juicy but holds together enough to cut clean slices, and it doesn’t leak a swimming pool-sized puddle of juice on the plate after the pie is gone. (My personal pet peeve!) I have a hard time imagining how it can be improved, but if you’re the experimenting type, a little lemon or orange zest would probably blend nicely and add another dimension. Enjoy! Strawberry and rhubarb is one of the best combinations ever! Thanks Medeja, I agree! There’s something magical about sweet berries + sour rhubarb. This pie looks sooo beautiful. The colour of that fruit is to die for and that lattice with the crimping is just perfection. Thank you Rochelle! I don’t make pies too often, but when I do I like to go lattice–there’s something so fun about the bits of fruit peeking out! I have always wanted to try this combo! 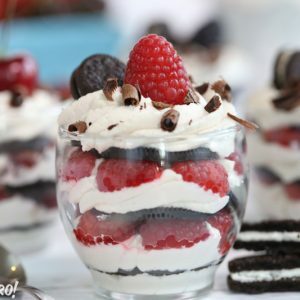 You are a mind reader – and an amazing recipe developer! Definitely pinning this one for summer. Everything about it sounds so good! Give it a try, Mary Frances! I think strawberries + rhubarb work well in all sorts of desserts, so definitely don’t limit the experimentation to pies! 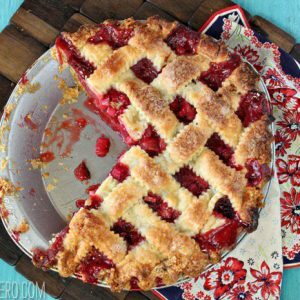 Yum 🙂 Strawberry rhubarb pie’s my favorite and this one looks delicious! Thanks Chloe–turns out it’s one of my husband’s favorites too, and I never knew until I made it this week. Ha! Your crust looks amazing! Mine never turns out like that. Therefore, I will now be on a pie-crust making mission to learn how to be like you. And I LOOKED for rhubarb the other day, because I heard it was in season – to no avail. My grocery has not received the rhubarm memo apparently. I’ll be waiting, desperatley, at their loading dock all next week. . . .
We had this rhubarb season discussion when I posted a rhubarb recipe, and then I got to thinking–I mean, I knnooowww I saw them and bought them, but where did they come from? Well, because it’s Whole Foods and they label everything, I can now tell y’all that apparently Washington is having rhubarb season. So I’m thinking you’re just too far away, Sara! Come west for the rhubarb! Would you please come to my house?! I bought 2+ lbs of rhubarb (because it was so beautiful and also because I wasn’t sure how much I needed for the pie) so I’m still drowning in rhubarb, even after making this. So we can solve two problems at once! Pides of March made me laugh and laugh. Gorgeous creation, as always, and that gif is so mesmerizing. My lattices always come out so… Rustic. Lastly and most importantly, I hope your little gentleman is feeling much much better! I almost put it on IG with a #whenenglishmajorsinstagram just for you! Et tu, strawberry rhubarb?? That is some good lookin’ rhubarb. I could definitely not say no to those! And that gif is really amazing. I’m usually intimidated by lattice crusts, but no longer. I hope your little guy is doing better! Thank you Natasha! I’m a little obsessed with gifs, and am thinking of doing a little tutorial. Now that they can be pinned on Pinterest I’m even more motivated to play with them! And A is much recovered, thank you so much! I really need to try rhubarb! 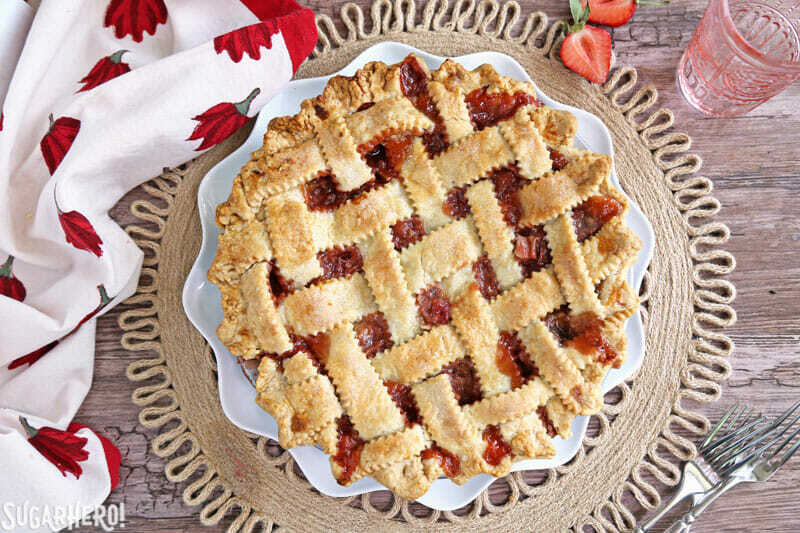 You make the lattice crust look so easy. Yum! Jett, you totally do! If you like tart desserts then I think you will love rhubarb! Yes, I think it’s 100% acceptable to eat your besties provided that they’re buttery and blubby. Ohmygosh that gif – I died. This pie looks unreal and I’m not even a pie person, but this guy made me change my mind. Haha, buttery blubby besties are the best! Glad to bring you on to Team Pie with this strawberry rhubarb beast. 🙂 Thanks Consuelo! True confession: I actually am more of a pie than a cake person. Yet another reason why we are perfect for each other – we balance each other out. WHEN are we going to meet in real life so we can have an all-dessert meal in which I eat all the cake and you eat all the pie?! This is my all time favorite pie! And I love the photos & moving images! Super cool. Thanks for sharing!! This makes me feel like it’s Spring time with strawberries in the garden! So pretty! Thanks Pamela! The weather here has been super springy (well, actually, summery) so it felt pretty appropriate! This pie looks absolutely gorgeous! Nothing better to get me into the mood for Spring. Love, love, love this!! Thanks Kathi! Bring it on, spring! Thanks so much, Milana! 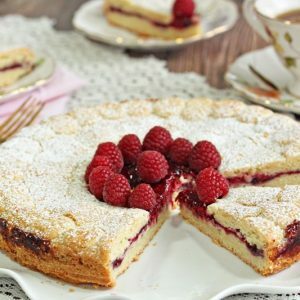 I’d love to hear what you think if you give any of the recipes a try! This pie looks like perfection! Can you believe I’ve never had rhubarb in a pie before? That has to change! Maybe I’ll even try growing it myself so I don’t have to buy it this year! Melanie, you have to change that! ESPECIALLY if you have the means to grow rhubarb! I’m an apartment dweller so that’s not in my near future, but if you have the ability–do it, girl, and then eat ALL the rhubarb desserts! Thanks, Marcie! This was the first rhubarb of the season that I’ve seen, and I totally couldn’t resist. It definitely won’t be the last! it looks amazing. i love this pie. This pie is absolutely gorgeous! I love the lattice GIF. your crusts look amazingly perfect. Teach me. ABSOLUTELY stunning as usual! I love how you did the picture videos (I have no idea what those are called). I have come to appreciate pie a lot more too, especially strawberry rhubarb pie! I have never seen rhubarb so pink! Where did you buy it? This pie is incredibly beautiful! I wish I had a fork and a big slice of this in front of me!! 😉 Yum! Thanks Jocelyn! Me too–it was gone too soon, hah! Always love the look of a lattice pie — they’re so pretty! Thank you–I’m in total agreement! They’re not hard but for some reason they always feel a little extra fancy. I just had to comment to say these pictures are freaking beautiful! I have always steered clear of the strawberry-rhubarb combo, but I’m not exactly sure why. I guess I haven’t had rhubarb, so it’s a “Fear what you don’t know” thing. I am not much of a baker, but next time I have the opportunity to buy a slice, I think I’ll give it a try. You’ve sold me! Thank you Jasmine! I can totally understand the rhubarb aversion. I honestly don’t think I ever had it until a few years ago–definitely never when I was growing up. It’s kind of weird looking, and the fact that it’s sour and mushy when cooked doesn’t really make it a big selling point! But if you are curious, DEFINITELY try it in a strawberry pie, I bet it’ll make you a believer! I LOVE RHUBARB PIE!! also, I’m pretty sure your lattice crust is doing the wave. I’m a fan. HA! It totally is. And I tooootally should have made the gif into an endless loop of the crust doing the wave. That would have been way better. 🙂 Thanks Karen! Great recipe! I just made this for a Memorial Day picnic today, and got rave reviews. Everyone loved the pie and the crust! The only thing I did differently (which was very minor) was add a 1/2 teaspoon of lemon zest as well. Hi Noreen, I’m so glad that the pie was a hit! A touch of lemon flavoring sounds like the perfect addition. Happy Memorial Day! My New Year’s resolution was to bake a pie a week for the whole year. 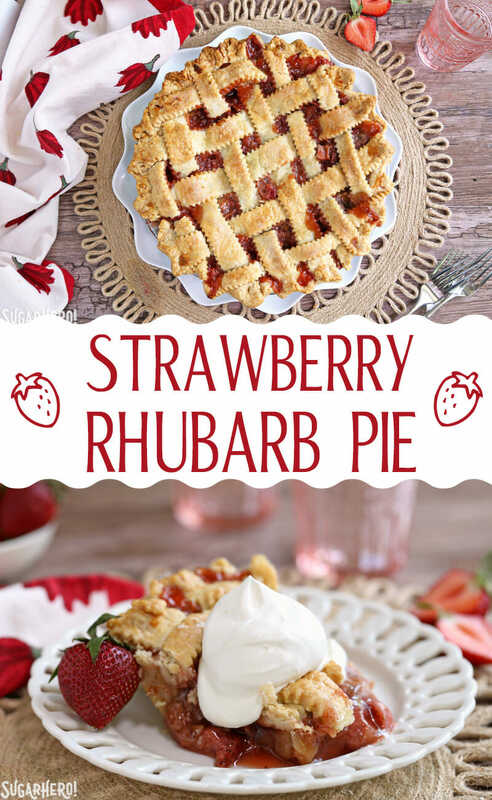 As my strawberries ripened I went looking for a Strawberry Rhubarb pie recipe. This one fit the bill perfectly and was pie # 23. I did use my own crust recipe which uses lard and vodka but followed the filling instructions. I liked the tartness of the filling and the addition of tapioca did keep it from getting too juicy. Your casual approach to the lattice top alleviated my anxiety and this was my most beautiful pie ever! I will have to plant some rhubarb for next year’s pie. Thanks for the comment, Jayne! I’m so glad that the pie worked out well for you. And WOW, a pie a week?! That sounds like such a fun (and delicious) project! Love to hear that you had such great results, thank you!